Mr. Robot has racked a slew of honors during its first season, as it won Best Drama Series, Actor (Rami Malek), and Supporting Actor (Christian Slater) at the Critics’ Choice Awards. Now the USA Network series has made its debut on Blu-ray and DVD via Universal Pictures Home Entertainment. 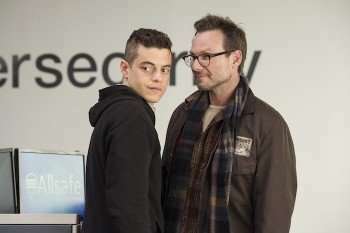 Created by Sam Esmail, the series centers on Elliot, a morphine addicted cyber security engineer who joins an underground hacker group led by a devil may care yet ultimately determined individual named “Mr. Robot.” Although Elliot’s exemplary skills at hacking usually gives him a leg up on both his friends (Portia Doubleday plays Elliot’s close friend and co-worker who is the object of his affections) and enemies (Martin Wallstrom is a tech savvy head of a powerhouse company named E Corp), his own drug addiction, mental instability, and rash decision making often leads to disastrous consequences. The program’s paranoiac look at how technology has affected humanity’s sense of identity and privacy is spot-on, and though Mr. Robot succeeds as a nail biting thriller, the series is also filled with well crafted storylines and performances (along with Slater and Malek, Carly Chaikin is also memorable as the sarcastic hacker who’s part of Mr. Robot’s crew). Plus, the series also has a great twist in its first season, and without giving out any spoilers – it may shock you to the core. Special features include deleted scenes, a making of featurette containing interviews with Sam Esmail, and a a five minute gag reel (Christian Slater and Carly Chaikin are particularly funny during the gag reel).